Café Hof ter Laeken is a historic bar located in Booischot, Belgium. This picture was taken and sent in by DVT. 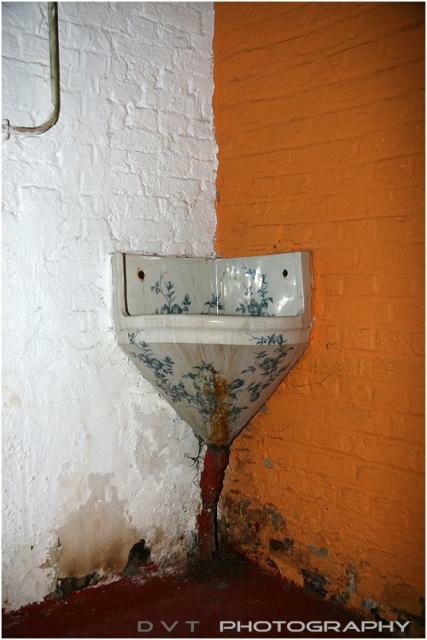 He writes: "The urinal is made in [Delftware] a special kind of handpainted ceramic from Holland." More information about Delftware: "Delftware, or Delft pottery, denotes blue and white pottery made in and around Delft in the Netherlands and the tin-glazed pottery made in the Netherlands from the sixteenth to the eighteenth centuries. "Delftware in the latter sense is a type of pottery in which a white glaze is applied, usually decorated with metal oxides. Delftware includes pottery objects of all descriptions such as plates, ornaments and tiles. "The earliest tin-glazed pottery in the Netherlands was made in Antwerp by Guido da Savino in 1512. The manufacture of painted pottery may have spread from the south to the northern Netherlands sometime during the 1560s. It was made in Middelburg and Haarlem in the 1570s and in Amsterdam in the 1580s. Much of the finer work was produced in Delft, but simple everyday tin-glazed pottery was made in places such as Gouda, Rotterdam, Amsterdam and Dordrecht"